Well, it would be if the weather perked up a little. However I did receive a little sunshine in the post which I will share with you in pictures to whet your appetite. Yes, as you may have guessed Hotel Chocolat have been lighting up my life again (uh huh, today I will only speak in song titles and cliché). This time they sent me a Summer Goody Bag and boy was it goody! Neapolitan Choc 6, White Chocolate Smiley Lolly, Raspberry Riot 100g slab, Caramel drops sachet and Salted Caramels. Sounds good doesn't it? It was all very tasty! I was really bad actually, I refused to share the Raspberry Riot Slab and as I expected it was heavenly. I am going to have to see if they sell that individually, it was amazing! The Salted Caramels were good, although caramels are not my first choice and the salt was subtle in them, in fact I think they could have gotten away with a little more. The Neapolitan Chocolates had a milk chocolate exterior followed by a layer of white chocolate and then a fruity cream centre. They were really good, but then I am a bit of a sucker for fruit creams. The Caramel Drops lived up to my expectations after my last try of their caramel chocolate, they just have such a good flavour. I have managed to save most of the bag to use in some baking (scratch that, I just looked in the bag and there are hardly any left, I think someone may have been nibbling) and well, the White Chocolate Smiley Lolly, it just makes you smile! Imagine receiving this pack as a gift! Actually Hotel Chocolat have a great selection of chocolate to give as Birthday Gifts. I keep hinting to Graham, but so far it is just Hotel Chocolat that send me these yummy chocolates. Oh well, I live in hope! Would you like to receive a little sunshine in the post? If so, then enter my giveaway for a Summer Goody Bag. To win a Summer Goody Bag just leave me a comment. 4. 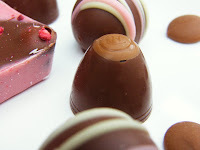 Like the Hotel Chocolat Facebook Page and leave a separate comment to let me know you have done so. The giveaway is open to UK residents only and runs until 17 July 2011. You DO get some wonderful things through the post. I wish my postman would take note...lol !! What can I say? Gimme chocolat!!!! Forgot to say I already follow your blog and on twitter. Every time I go in a Hotel Chocolat I want everything I see and sadly can never justify it, mostly because I want everything! Gosh that looks SO yummy, just the kind of sugar rush pick me up I need! And follow you on twitter too!! Oh wow, looks heavenly :)Just my kind of prize ! wow that all looks bloody delicious! Per usual, I wish I could enter!! 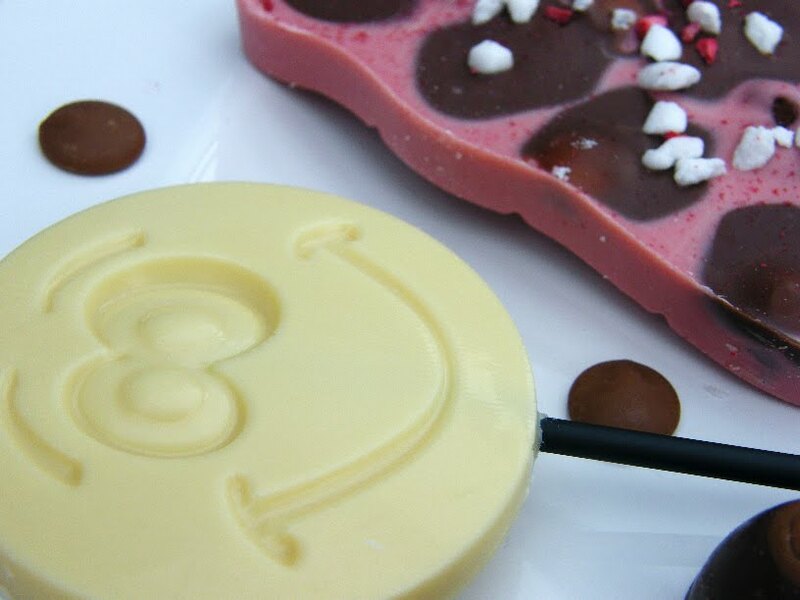 Especially for the adorable white chocolate smiley lollipop! So cute. Wouldn't that make a cute table gift at a luncheon?? I just started to follow you blog, as I only discovered it today. It is a nice place, I hope to come back more often. 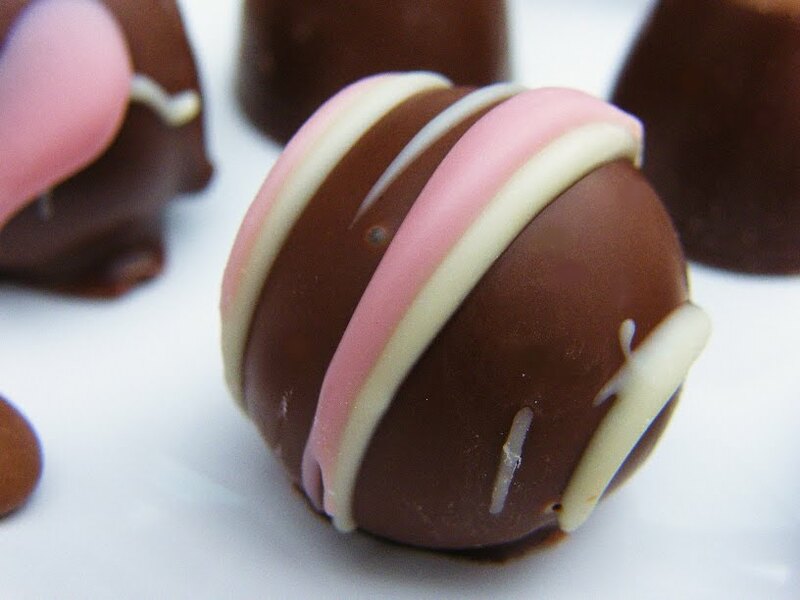 I love chocolate and never tired the one you have tested. I love your review, it is clear, straight, full of information. Well done! I follow your blog through my rss to google reader! yes please!!!... not that i'm jealous in any way! oh, what a wonderful giveawy - in danger of dribbling all over my keyboard! already following your wonderful blog! 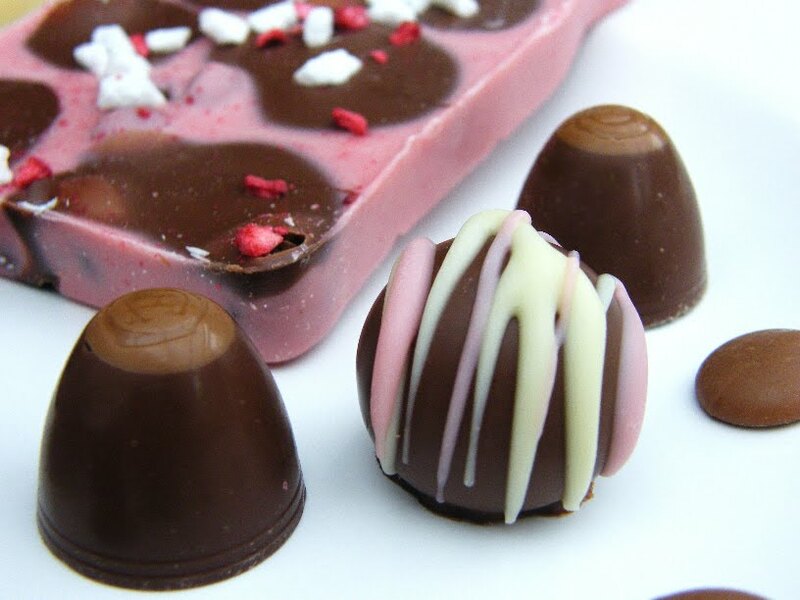 already following hotel chocolat on facebook! Chocolate always makes me happy. I wish I got choccies in the post! 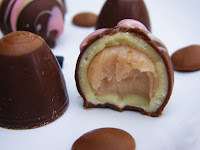 These look fab, I love salted caramels! Get thee behind me satan, I don't want any chocs, I'm on a diet after my hols lol! Now we're dead and gone to chocolate heaven. You've made our day! 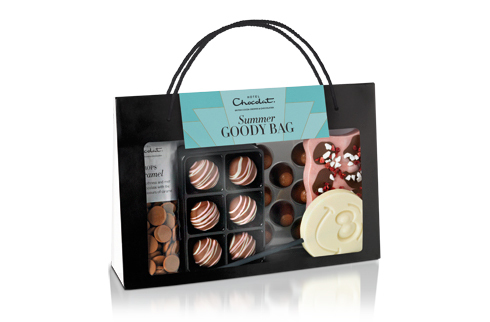 The goody bag selection looks wonderful - I've never tried Hotel Chocolat products before - they've always been a bit expensive for me - so I'd love to win ! 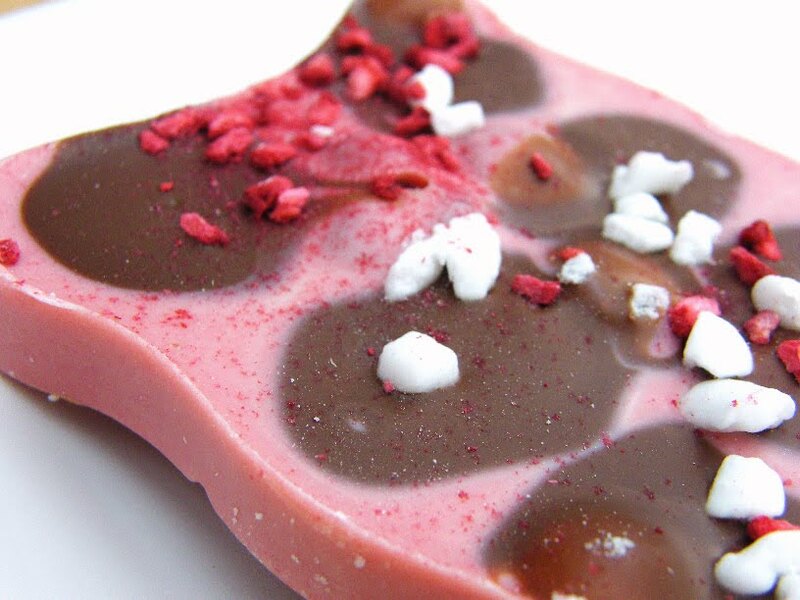 You know i want this and like you I probaby would have great difficulty sharing it. 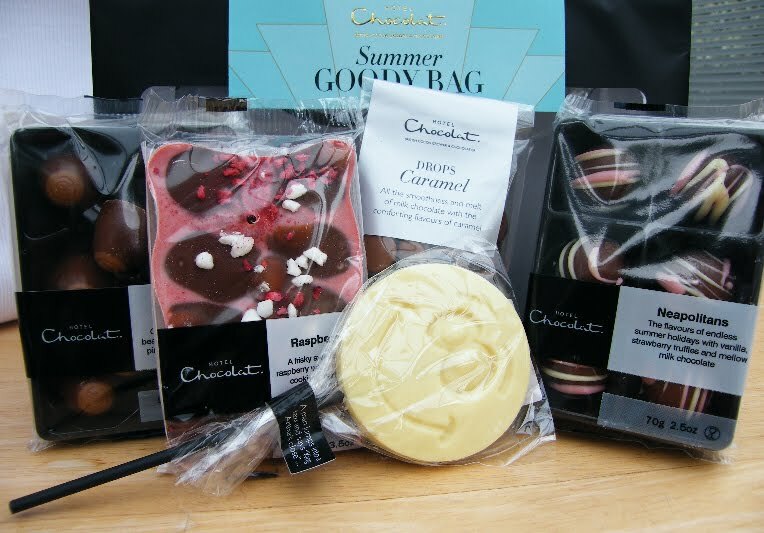 Oh Hotel Chocolat chocolates make me so happy, I would love to win this summer goody bag! Thanks for the opportunity. Have liked Hotel Chocolat's facebook page. What a lovely little comp, brilliant! The goody bag looks to die for. Oooh - how I wish I could have something lovely from Hotal Chocolat in my post!! How do I get Hotel Chocolate to send me goodies? These look delicious so all my fingers are crossed.